A controversial popular science title in which Jim Baggott asks whether all that we currently know about the universe is based upon science or fantasy. Modern physics is heady stuff. It seems that barely a week goes by without some new astounding science story; some revelation about hidden dimensions, multiple universes, the holographic principle or incredible cosmic coincidences. But is it true? What evidence do we have for super-symmetric squarks, or superstrings vibrating in an 11-dimensional space-time? How do we know that we live in a multiverse? How can we tell that the universe is a hologram projected from information encoded on its boundary? Doesn’t this sound like a fairy story? In Farewell to Reality Jim Baggott asks whether all that we currently think we know about the universe is based on science or fantasy. In addition he wonders whether these high priests of fairy tale physics – such as John Barrow, Paul Davies, David Deutsch, Brian Greene, Stephen Hawking, Michio Kaku, Gordon Kane and Leonard Susskind – are the emperor’s latest tailors. Baggott knows his physics pretty well. The first part of the book is a decent enough run through of the current state of physics and cosmology – the “Authorized Version”, as he describes it. He isn’t afraid to take on philosophy of science either, and discusses “the scientific method” in a way which makes sense to me. Baggott has a point, and he makes it well, although his target is as much the way this science is marketed as what it contains. 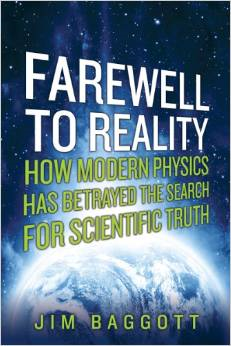 It’s always good when a book of popular science has a clear line to argue, and Jim Baggott’s line is very clear indeed: modern physics has become “fairytale physics”, full of dazzling concepts, such as string theory and the multiverse, which are based solely on mathematics rather than empirical content, and have no predictive power. His fierce and refreshing polemic does a fine job of helping readers understand some of the knottiest ideas in contemporary physics. This is all the more remarkable as he eschews analogies, arguing that they tend to confuse rather than illuminate the counterintuitive ideas and phenomena he describes. Baggott thoroughly analyses the cracks in the authorized version of reality (such as the disjunct between quantum theory and general relativity) and equally problematic explanations, such as superstring theory. The big questions, he argues, demand context-awareness, and the courage to make doubts public. 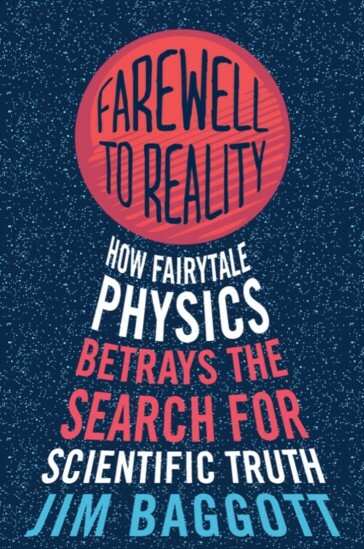 In consistently accessible and intelligent prose, Baggott sympathetically captures the frustrations of physicists while laying out a provocative—and very convincing—plea for a reality check in a field that he feels is now too “meta” for its own good.